Why invest in an online impact tracking tool? We've blogged previously about the dangers of seeing these systems as the solution for tracking impact. To be successful, any system must have the needs of the people generating the impacts at its heart, and reflect the perceptions of those who are actually using the research. So an online impact tracking tool is probably only going to be one small part of a wider systems that’s embedded at various levels in your institution. If you get this right, then you might have a bunch of people who are motivated to record impacts as they are generated, and who might want an online system to help them keep track of it all. If you want to start using an impact tracking system, the first choice you are likely to be faced with, is between buying access to an existing system or creating your own in-house system. The table below summarises some of the pros and cons of each approach. The University of Coventry developed their own in-house system. A more stripped-down prototype in-house system has been developed by University of Leeds, and other Universities are developing their own systems. 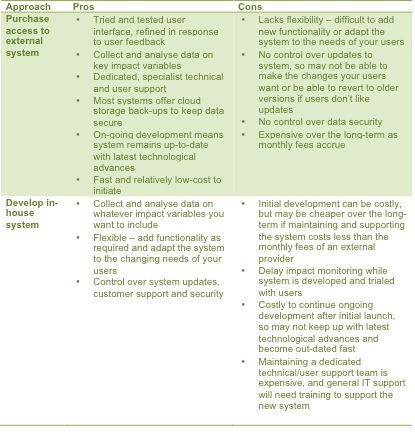 In-house systems offer the ability to tailor the design to the specific needs of the institution, and the capacity to adapt the system to the changing needs and preferences of local users, but this typically comes at a high cost. For many, the decision will boil down to whether the University has the expertise to develop and maintain a system with the functionality it wants, and whether up-front costs of development and the long-term costs of maintaining, updating and supporting an in-house system are worth it. For some, these sorts of costs may be hidden and make use of existing teams that would otherwise be under-utilised. Although some of the off-the-shelf options may be comparably expensive, some are likely to be far more cost-effective than developing an in-house system. Although these systems might not offer everything you want, given how much money and time you could save, it is worth taking a serious look at what’s already out there. We decided to road-test three of the most widely used and relevant existing systems for tracking impact. We started by creating accounts and trying the demos that are publicly available. We then sent our evaluations to each company and asked for feedback, which led to some personal tuition in the capabilities of some of the sites. This means you’re able to read the most detailed and accurate assessment to date of these systems’ ability to track research impact. Table 2 provides a comparison of features from these three sites. It is important to note that each of these systems has been designed for very different purposes, and so this is not a “like for like” comparison. The comparison is based purely on features that are designed to track impact, or in the case of ResearchFish®, we focus a sub-set of impact-related outcomes that are routinely captured in their system. We have not reviewed systems that are focused solely on collecting details of publications (e.g. Pure and Mendeley), even where these offer collaborative spaces for researchers to interact with each other. Bibliometric measures of impact, even when these related to public interest in research, are fairly crude indicators of actual impacts on society, and would not be eligible for inclusion in most assessments of research impact. However, Altmetrics are growing in popularity and do offer a number of benefits to researchers who want to enhance their public engagement. In addition to ImpactStory, covered here, there are other altmertric websites that measure online impact of research in relation to the amount that articles are viewed, downloaded, discussed and cited, such as Figshare and Altmetric.com. There is also a range of other tools that can enable collaboration between researchers and that may be adapted to collect information about impacts, but these are not considered here as they are not specifically designed for researchers or for tracking impact (for example, Microsoft Office 365 and Yammer, Sugar Customer Relations Management Pro, and LinkedIn Sales). In a nutshell: According to their website, ImpactStory is, “Your CV, but better”. Provides information about how research publications (and other products) are read, cited, tweeted and bookmarked. In a nutshell: A research outcomes data collection service used by most UK research funders to track and communicate their investments, which can be used by researchers to build a personal portfolio make their research impacts visible to stakeholders. Cost: Free access for researchers whose funders use the system; Institutions have access to the system for the purposes of compliance or £1000 per year for the ability to access the outputs data and access data analytics and API for integration with other databases. · Kolola focuses on enabling communication between researchers around knowledge exchange activities and providing institutions with flexible tools for tracking knowledge exchange activities across their institution. · ResearchFish® focuses providing standardized data analytics to compare specific impact-related research outcomes both across and between institutions. · ImpactStory is focused primarily on providing data to individual researchers about the reach of their publications. Both ResearchFish® and Kolola enable researchers to record impacts as they occur, and can be used to prioritize further work to build capacity for impact or develop more detailed narratives about specific impacts. A decision between Kolola and ResearchFish® is therefore likely to be about the importance of creating collaborative spaces for researchers around the recording of knowledge exchange activities that might indicate impacts, versus data analytics to detect impact-related research outcomes. For institutions, ResearchFish® presents better value for money, with its £1000 per year price tag, and its focus on collecting and analyzing impact-related outcomes. It is also likely to be used by a high proportion of researchers already, and so despite having a less user friendly interface than Kolola, people are likely to be familiar with it and less likely to complain about duplication of effort (if they’re already being mandated to report impacts to research funders via ResearchFish®). The value of Kolola is therefore likely to be for specific projects that anticipate a range of knowledge exchange activities leading to impacts. On a project-by-project basis, Kolola becomes more cost-effective, and it may in many cases be possible to fund subscriptions to the service via research funding. 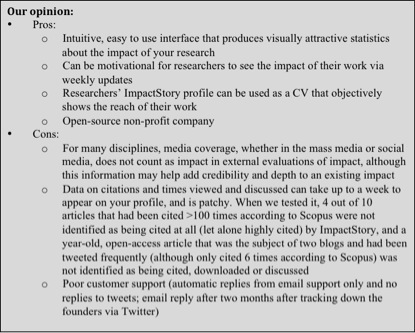 Despite its title, ImpactStory does not capture the societal or economic impacts of research, but can be a motivational tool to help researchers monitor and improve their online presence and the reach of their research publications. 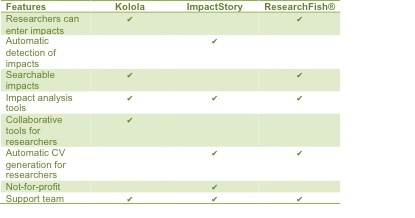 The final verdict: for most institutions, if you’re looking for an off-the-shelf product, you’ll probably want to rely on ResearchFish® to track impacts across your institution and promote KOLOLA on a project-by-project basis to help researchers manage and report on their knowledge exchange activities. Note: this review was provided to all three companies for comment and developed in response to feedback from them all. The author has no conflict of interest with the companies reviewed and will not benefit in any way from the contents of this blog.